We are committed to providing our customers with exceptional gourmet food experiences and quality customer service. Have a question about our products or policies? Submit your inquiry through our Contact Us web page. We’ll return your e-mail as soon as possible, typically within one business day. Spanish Suitcase accepts the following credit cards: Mastercard, Visa, Discover and American Express. All prices are subject to change without notice. Prices listed on product pages do not reflect the cost of delivery. We do not ship C.O.D. Sales taxes will automatically be added to any applicable purchase. 4. Gift shipments sent to recipients who are out of town or otherwise unavailable to receive their shipment. Even if your purchase is mean meant as a surprise, please notify recipients of the pending arrival of perishables! All products are final sale. However, if you receive an assortment that contains damaged or spoiled goods, we will quickly work with you to remedy the issue. Please contact customerservice@spanishsuitcase.com and we will return your e-mail within 48 hours. 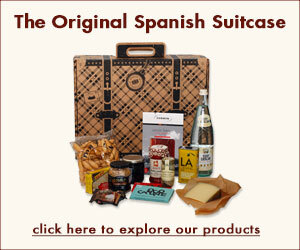 Before placing an order with Spanish Suitcase, please review our shipping policies. It takes two to three (2-3) business days to receive and process your order. Shipping days are Monday – Thursday. How are non-perishable items shipped? Customers purchasing non-perishable product assortments may select to ship their order using Ground, 2-Day or Overnight services. We partner with both FedEx and UPS shipping services. How are perishable items shipped? Customers purchasing perishable product assortments (indicated with a marked with a snowflake ) are required to ship with expedited shipping. We have arranged a special fixed-rate pricing for these items. If you have special shipping needs, we will do whatever we can to accommodate your requirements. Please click here to contact us and we’ll try to find a solution. A tracking number will be emailed to you when your order ships. This tracking number will allow you to check on the delivery status of your order. We do not require a signature for our shipments. To ensure that you receive your product in a timely manner, and in top condition, please track your shipment so that you can be available to intercept it. If the purchase is a gift being sent to someone else, please notify recipients of the pending arrival of perishables! With the exception of perishable product assortments items, we can ship to P.O. boxes. At this time, we ship exclusively to customers in the contiguous 48 states of the United States.